Today, we are surrounded by the machines that make our life easier in a way that we can dedicate out free time to ourselves instead, for instance, of washing clothes or dishes manually. Home appliances make people enjoy life more. Bearings for household electrical appliance motors are a very important market for HCH. Household electrical appliance motors mainly include air conditioner fan motors, range hood fan motors, washing machine motors, vacuum cleaner motors and ceiling fan motors. In line with appliance manufacturers’ increasingly stringent requirements, motor manufacturers demand bearings of higher quality and better performance. HCH understands your requirements of low noise, silent running, long life, high quality, less friction and more energy saving for household appliances. HCH bearings are at the very heart of all the answers. Worldwide availability of HCH products is supported by a comprehensive technical advisory service. In committing itself to excellence in products and performance, HCH puts at the service of household appliance industry its expertise acquired through years of research and commitment and we highly appreciate our customers in household appliances to share their requirements and improve together with HCH. Household appliances are usually working in indoor places. Excessive vibration and noise levels associated with household appliances are strongly required to be eliminated. Excessive vibration can cause premature equipment failure. High vibration levels also increase energy consumption. High noise levels, in turn, result in a poorer life environment for personnel and family. HCH offers a range of solutions for exceptionally smooth and quiet bearing operation. The cost for energy rises day by day. Reduced energy consumption is of ever increasing importance. Energy consumption can be reduced in several ways. However, the most important for bearings is to reduce the friction inside, by choosing low-friction grease, optimized seals and shields design. 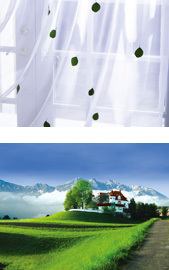 When environmental legislation becomes more stringent, environment protection also comes important of ever, especially in household appliance, which is the closest part to personnel. Even the bearing is an inner part of a household appliance, HCH bearings all pass RoHS to make sure that no single piece is with harm. In many applications of household appliances, especially when we talk about a portable tool, the reduction of weight is extremely important. As a result of the engineering knowledge application on new materials, advanced calculation tools and integrated solutions, it is now possible to increase the power density. This improvement has a strong impact on weight and size reduction with the highest level of reliability. All over the world, manufacturers of household appliances rely on the products and services of HCH. We have the wide product range in this field. Our experienced application engineers optimize the standard bearing solutions by choosing the bearing dimensions, clearances, lubrication and sealing best suited to the different requirements.